Published in Stony Plain Reporter/Spruce Grove Examiner, Friday, August 28, 2015. Hundreds of runners will soon lace up to raise money and awareness for suicide prevention in this year’s Rotary Run for Life. 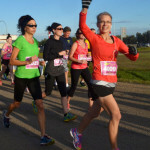 In its 12th year, Rotary Run for Life will see participants walk five kilometres, run 10 kilometres or a half-marathon on Sept. 13 in Stony Plain. The event starts and finishes at the Heritage Park Pavilion and will take runners and walkers through Stony Plain’s trail network. Each year the event serves two purposes, said Alyson Brown, chairperson and race director. First, it raises money for local mental health initiatives and second, it provides an opportunity for people who have lost a loved one to suicide a place to remember, reflect and heal. 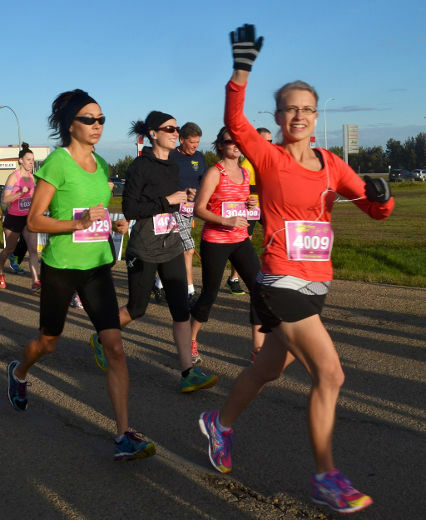 After the run, a ceremony will be held in the Heritage Park Pavilion which will include a Chinese lion dance by Silent River Kung Fu in Stony Plain, a presentation on suicide awareness and prevention, race day prizes and a warm breakfast. Last year, Rotary Run for Life raised $53,000 in net funds — half of which was given to the Co-ordinated Suicide Prevention Program (CSPP) and half split evenly between the Rotary Clubs of Spruce Grove, Stony Plain and Parkland After Dark. Each organization earmarks the funds for local mental health programming and services. Brown says Rotary Run for Life is a challenging event because it must provide important moments of solemn remembrance while creating an upbeat, welcoming environment where people can feel comfortable sharing their own experiences and stories. “We want to create an open atmosphere so people can share what they’re going through,” she said. This year, the event will include participants from two Stony Plain schools who have entered teams into the run. “We’re trying to get the schools involved, get the kids involved at a young age so they can become more comfortable with this topic and know there are options and channels they can go through if they need help,” Brown said. Each year, students across Parkland School Division hear from Sharida Csillag, the CSPP co-ordinator, about the programs and services they provide and about Rotary Run for Life. Brown and Csillag hope that teachers and principals will help get the kids involved. This year, students from Memorial Composite High School and Meridian Heights School are registered to participate. Rotary Run for Life organizers are still in need of roughly 30 volunteers to monitor the race route, help with the setup and tear down of the event and keep things running smoothly at the start and finish line. Corporate sponsorships are always welcomed and encouraged. 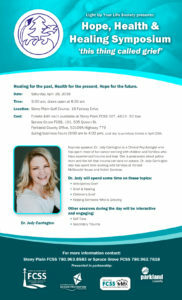 For more information on registration, volunteer opportunities and ways to donate to the event, visit www.rotaryrun.ca.